Dine Alfresco at waters edge. This charming, 2 bedroom, 2 bath Eagles Nest #2 home, has 2 screened porches and a large open air patio for dining and relaxing. The main level has a queen in one bedroom, a full in the other. Both offer ample closet and drawer space. Living room offers a beautiful gas fire place, picture perfect lake views, and the comfort of home. Fully stocked kitchen for all your cooking needs. Newer bathroom with shower. Lower level has porch, 2nd living room with gas fire place and new bathroom with shower. Washer, dryer and a second refrigerator. Family room with queen sleeper. Maximum 8 guests. Outdoors, enjoy a new 40 foot dock with bench and ladder for swimming and space for sun bathing and a second screened porch at waters edge. A boat (no motor), canoe, two kayaks and paddle boat are included for your water enjoyment. Linens, toilet paper, garbage bags, kitchen hot pads/towels, dish soap, and garbage service are provided. Please be sure to bring your own bath towels and toiletries. 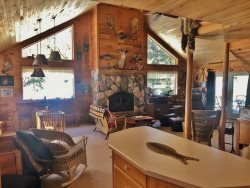 Living room features gas-burning fireplace and large windows facing the lake. Kitchen supplied with , oven, microwave, refrigerator/freezer, small electrical appliances, fully-equipped with dinnerware and cookware. Dishwashing soap, garbage bags, kitchen towels and pot holders provided. 16 miles from Ely Eagles Nest #2, is located mid-way between Tower and Ely, offers a variety of fishing and recreational opportunities. Eagles Nest is over 1000 acres in size and is nearly 50’ deep with no motor restrictions. The lake is home to smallmouth bass, walleye, northern pike, perch, bluegills, and crappies. Rates are based on 4 guests, maximum 8 guests. Additional guests are $105/week per person.